VaporFi, formerly VaporZone, is a leading manufacturer in the domain of electronic cigarettes, e-liquid, eGo vaporizers and even feature a variable power personal vaporizer or PV mod. 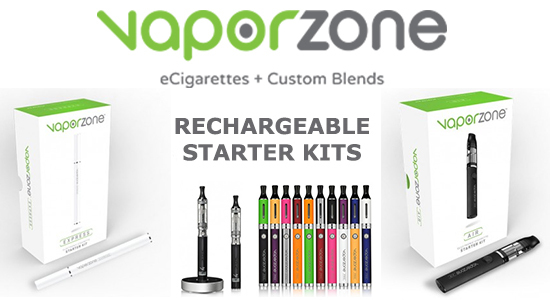 The more we test, the more we like and we want to quickly go over the available starter kits offered by VaporZone with you, so that you don’t feel so overwhelmed by the range of different devices offered with each starter kit. VaporZone has 6 starter kits to pick from, which is not that many, but almost each kit has a different device offered, from your traditional electronic cigarette to a few different eGo vaporizers and even a power MOD vaporizer like mentioned. So let’s get to it and have a quick peek at them. Automatically Applied At Checkout Exlusively For Our Visitors! The Express Starter Kit is VaporZone’s standard compact sized electronic cigarette model made to resemble an analogue. It remains VaporZone’s most popular model simply because it is the easiest to use, cheapest and requires little to no maintenance. Using convenient disposable cartridges, you never have to wash a tank before changing flavors or dealing with leaks. At such a competitive price, we think everyone should get a VaporZone Express kit! One thing to note is that the kit does not include any cartridges, but picking flavors with VaporZone is half the fun. They have a variety that is hard to match, developing amazing flavors all the time. You have the choice between convenient pre-filled flavor cartridges in any nicotine strength, or you can opt for blank cartridges and fill them up with their selection of flavored e-liquid bottles. The VaporZone Air is the first level up eGo type electronic cigarette. It features a 350 mAh battery allowing for a more powerful atomizer while still keeping a very compact size, easily fitting in the palm of your hand. The design itself is very noticeable and speaks quality, with an oval overall shape, it breaks the traditional cylindrical shape. The eGo electronic cigarette has a refillable tank that gets replaced every couple of months. You can fill the cartomizer tank with any flavors you choose. The device certainly delivers more punch and vapor than standard models and presents a perfect first upgrade at very low cost. The Pro Starter Kit is another notch up on the eGo electronic cigarette ladder. VaporZone introduced this model for users who want more power without fully going to a variable power personal vaporizer device. The Pro model boasts a 3.7V, 650 mAh battery producing amazing results and customizable settings comparable to many bigger personal vaporizer mods. The device is longer in length but remains lightweight and comes in 10 different colors and finishes. You also have the option to upgrade to a 1000mAh battery and go from a 1.5ml to a 3.0ml cartomizer for just $3. VaporZone’s Platinum Pro vaporizer is designed around the Pro model and simply features some upgrades that appeal to the advanced users quite a bit. It has the same 650mAh batter with option to upgrade to 1000mAh, but it has an upgraded VaporZone Platinum Clearomizer Tank that features higher performance and 2.5ml capacity. Yet another similar model featuring yet more upgrades is VaporZone’s Pulse Kit. The Pulse vaporizer offers a bit more on the versatility end with multiple accessories and easier to fill tanks. It also comes with 2 batteries, both 650mAh, and features a digital display showing battery life and counts your puffs so you can best control your usage. An extra circular charging base is also included with the standard chargers. Finally, last but not certainly not least, we have the VaporZone Rebel. This is what you would refer to a Personal Vaporizer or MOD, a variable power vaporizer device much larger in size but that features the largest cartomizer tanks and even dual atomizer tanks for those advanced techy users looking to produce large amounts of vapor. This device is way more advanced and you should read our detailed review for more information on the VaporZone Rebel. If you are completely new to what a PV is, you should head to our Personal Vaporizers mod page and quickly read up on what they have to offer.